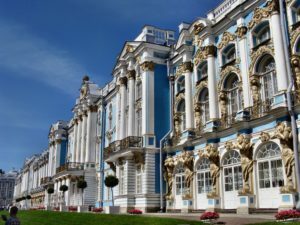 This full day tour combines a driving tour through the city, and visits to the Catherine’s Palace in Pushkin and it’s park and Paul’s Palace in the town of Pavlovsk and it’s park. You will drive by the main city street – the Nevsky prospect, have several stops at the most picturesque places for a great photoshooting, than visit the birthplace of the city – the Peter-and-Paul Fortress and it’s cathedral, that holds the tombs of the Russian Tsar’s. Catherine’s Palace in Pushkin town was started in 1717 as a small residence during the reign of the Empress Catherine I, but 40 years later, it was reconstructed by the order of the Empress Elizaveta Petrovna. The palace interiors host the world famous Amber room (Amber Chamber), that was completely restored to it’s historical look. The Paul’s Palace in the city of Pavlovsk was built in 1784 by the architect James Cameron for Paul, the son of the Empress Catherine II. The landscape park of Pavlovsk named to be the largest in Europe, and the best in the means of planning. Tour duration – 9 hrs.